Some people love to go on outdoor adventures like mountain climbing, trekking, or extreme sports. There are also those whose idea of outdoor activity is taking a stroll in the park, a dip in the clubhouse pool, or playing with the kids in the backyard. Although I consider myself as an indoor person, there are also outdoor activities that go beyond the metro which I enjoy with the kids. One such activity is camping. It may have taken me quite a while to appreciate camping trips when I was growing-up but now that I have my own kids it is a totally different story. 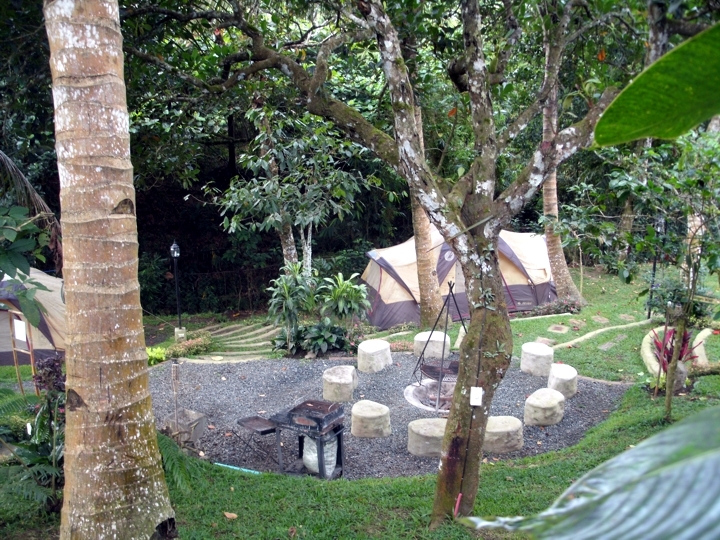 Here is a picture of the tents we saw at Nature Spa at Tagaytay when we visited the place last year. I wish we can come back there and stay in of those. Spending a night in a tent with nature all around you can be an exciting adventure for the kids. However, it can also be an uncomfortable experience if one isn’t geared up for it properly. Tent, sleeping bag, protective clothing, camp cooking implements, emergency or medicine kit, matches, lantern, bug and mosquito repellant, water filter, and food are my priority picks in preparing for camp. The North Face, Blacks and Eurohike are three of my preferred brands for camp equipment while Coleman tops the list for food and cooking gear. I also choose items that are made from lightweight and durable materials so that we don’t have to break our back toting our gear to the campsite. The kids are always excited to help out in pitching the tent and choosing their places inside as soon as it is up. I also love the look of wonder in their face whenever they discover a new insect or animal in their wood exploration or whenever they show us what they’ve learned from the camp facilitators. Getting down and dirty with nature trips and making do with spartanly equipped restrooms in the camp isn’t my cup of tea, but seeing the kids having fun and being there to share their joy in camp makes everything worth it. My son is very fortunate to have camping activities in school and he says it is very fun, enjoyable and exciting.